The sun sets along the Ohio River at Gallipolis on an evening last February when much of southeast Ohio was flooding. GALLIPOLIS — Gallia Commissioners along with the Gallia Engineer and the Gallia Emergency Management Agency met Thursday in the Gallia Courthouse to discuss the potential for applying for Federal Emergency Management Agency dollars to assist in covering reconstruction efforts due to damaging floods in the February season earlier this year. 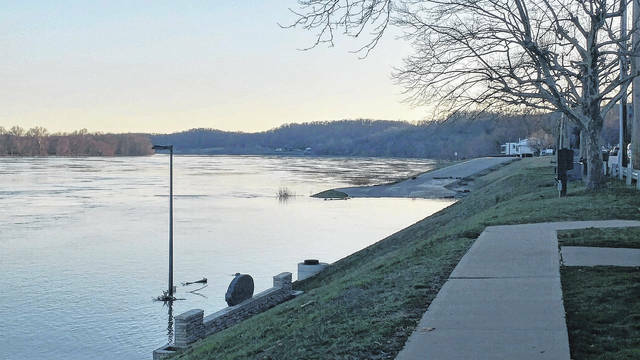 According to the meeting, Gallia Engineer Brett Boothe and his office had already applied for funding by using an online FEMA portal and submitting paperwork detailing reconstruction project needs. Gallia Commissioner David Smith said he anticipated a face-to-face meeting with a FEMA representative Tuesday. Most in the meeting felt there may be a new system in place FEMA was reportedly utilizing for funding opportunities of flood damage reconstruction projects. Those present agreed they needed some questions answered. Boothe noted that his office was still catching up with slips from flooding in the summer of 2015 and any financial assistance the county could receive was needed. “We want to make sure that the county doesn’t miss any financial opportunities for something like this. We need to make sure we get all questions answered, ” said Smith, Thursday. The commissioners would eventually call for an executive session to discuss contracts with those present through an open phone conversation with a FEMA representative. The commissioners declared a state of emergency Feb. 26 after Ohio Gov. John Kasich made an emergency declaration for 17 counties bordering the Ohio River due to flooding. According to Gallia Emergency Management Agency Director Sherry Daines previously, around 30 roads throughout the county were closed as of morning the state of emergency was declared. Counties included in the governor’s declaration included Adams, Athens, Belmont, Brown, Clermont, Columbiana, Gallia, Hamilton, Hocking, Jackson, Jefferson, Lawrence, Monroe, Meigs, Muskingum, Scioto and Washington. “I remember in the 1997 flood it was over on Eastern Avenue in a few place,” said Smith previously. “When people start becoming isolated it becomes a greater emergency.